← UoPeople Students: How would you like to intern with Hewlett Packard, the world’s largest technology company? A few weeks ago, I had the pleasure of joining 1,000 other social entrepreneurs at the Ashoka Changemaker’s Campus on June 21-22 to help design social solutions. With so many other social entrepreneurs around me, I could feel the energy of how our world is changing – for the better. Every one of us left the Ashoka Changemaker’s Campus event more energized, inspired, and committed to further changing society. 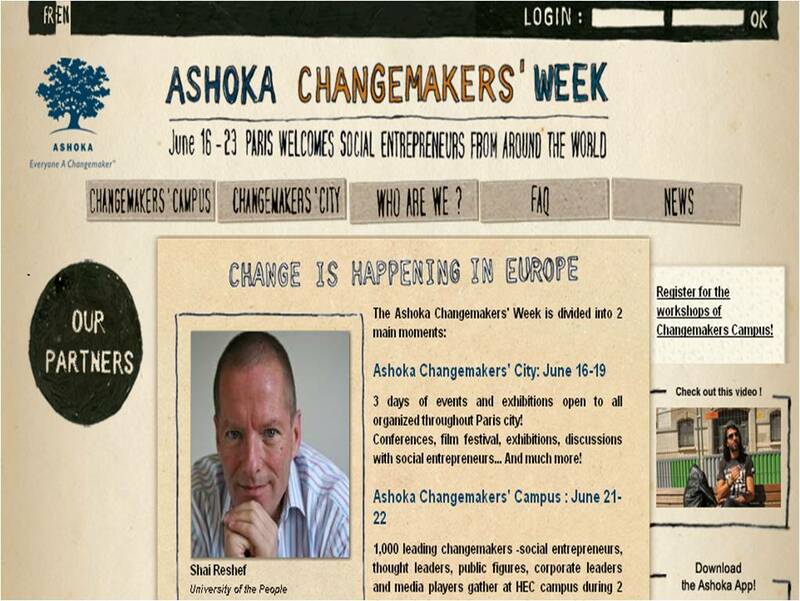 Ashoka is the global association of the world’s leading entrepreneurs. I was honored to have been nominated as an Ashoka Fellow in 2010. As a Fellow, I attend events to help share my knowledge with others, as well as continue my personal commitment to create social change with University of the People. However, while being nominated as an Ashoka Fellow is a privilege, Ashoka, and myself, believe that everyone is a changemaker – down to the choices you make, the businesses you wish to start, and the dreams you put into action. Many of UoPeople’s students have expressed their hope to start socially responsible enterprises and non-profits upon graduating from UoPeople, and we could not be happier knowing that we have inspired visions of change that they will one day create. The world of the future – will it be a peaceful world? An environmentally stable world? A favorable world that embraces diversity and is accepting of people’s differences? The choice is up to each one of us to create the world we wish to live in: What change will you make? This entry was posted in Uncategorized and tagged Ashoka Changemakers, change for the world, non-profits, shai reshef, socially responsible businesses, the world of the future, university of the people. Bookmark the permalink. I think I’ll start small. With our small town. There’s so much that can be done here.